There’s nothing more frustrating than having office equipment that isn’t reliable. Whether it’s a computer or a printer, those of us with busy schedules can’t be slowed down by an office utility that doesn’t do its job when we need it to. Reliability, convenience and ease-of-use are key when it comes to the home or the workplace. Depending on your needs and the needs of your team, finding the right gear for the job can be even more daunting than doing the job itself. It’s almost impossible to know if the kind of device you’re about to purchase is going to hold up for weeks, months or even years down the line. This is especially true of printers, scanners and copiers. In this review we’re going to be checking out the HP LaserJet Pro M281fdw Wireless Color Printer to see what its applications are and how it stands apart from similar devices. We’re going to be looking at the design, wireless capabilities, highlighted features as well as the efficiency of the M281 to give you a fully comprehensive idea of what this newly released printer can really do. The HP M281 is simple in its design and is actually compact enough to fit on a desk. Measuring at 16.6 x 16.5 x 13.2 inches, it won’t take up much space, and our first impression was that it looked fairly easy to use. However, you’ll want to decide ahead of time where you put the printer before unboxing it. It weighs in at 47.7 pounds, so you won’t be moving it around much once it’s fully set up. It only comes in an off-white color with some black accents, but we didn’t see the lack of color options to be too much of an issue. For a device that is mainly built to perform, color options weren’t all that important. It had a rectangular shape, and the hard-plastic outer shell felt strong and well-constructed. On the front we noticed a small touch-screen with pretty clear options for copying, faxing or scanning, as well as a reset option. 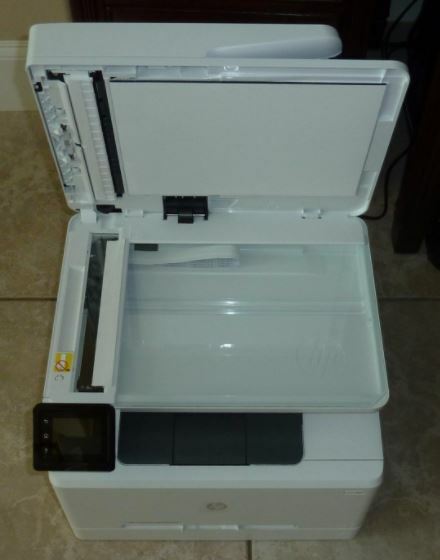 The power button was located on the lower right hand side and the paper tray was situated on the bottom of the printer. On top we found a pretty standard looking feed for copying, as well as the scanner itself enclosed under the copier feed. There was also a USB port on the front of the device, which we assumed was for optional wired printing, even though the device is billed as being fully wireless. 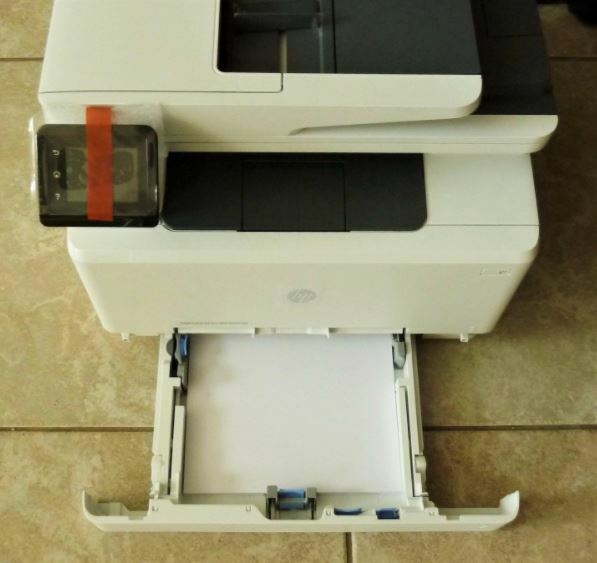 As far as multi-purpose printers, its design was familiar, easy to figure out and didn’t seem like it was going to be a headache to set up or install. The HP M281fdw is loaded with some really amazing features. First and foremost, the entire unit is fully wireless. You’ll be able to connect to your own WiFi network, as well as print directly from your smartphone or tablet with the new HP Smart app. Using the app, you can even scan documents on the go and send them to the printer from your phone. The app also allows you to alter the printer’s settings and print from your Dropbox account. As far productivity is concerned, we found the full-integrated app to be a really useful addition. The next feature that we really loved was the fast, two-sided color printing. HP claims that this printer is the fastest printer on the market when it comes to color printing double-sided documents. It can print 22 pages per minute and the input paper tray can hold up to 250 sheets at a time. When we tested out the printer we were extremely impressed with how quickly it not only processed our print job, but how fast and precise it printed out documents. We felt that the double-sided color printing feature would be perfect for those who are interested in printing brochures or promotional material for their business. It is also capable of handling various paper sizes so you can print, scan or copy letters, legal documents and envelopes. Lastly, even after a few print jobs, we saw no evidence of paper jams, which was really important. A printer that jams frequently can really slow things down when you’re trying to be productive but the M281fdw, if you load it correctly, seems to be equipped well enough to prevent these kinds of issues. Granted we didn’t use it for weeks at a time, but we gave it plenty to produce and it delivered without a problem. The HP M281fdw also has a built-in security feature called JetIntelligence that can identify whether or not an ink cartridge is genuine HP, already used, or fake. When it came to saving toner and getting the most out of each cartridge, this was a huge plus. JetIntelligence really serves no other purposes aside from helping you save money on cartridges and optimizing your printer’s performance. It wasn’t essential, but is definitely the kind of thing that makes us think HP wanted to make a device that was user-friendly. The last addition that stood out for us was the WiFi direct feature. 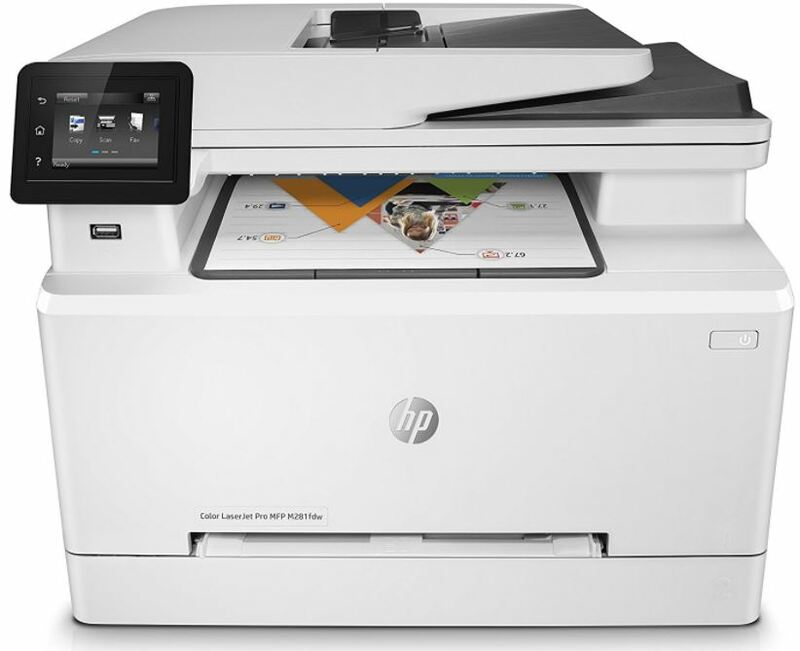 A lot of wireless printers can be used over an existing WiFi network, but the HP M281 can connect to a smartphone or tablet directly by emitting its own WiFi signal. This made using the app as well as overall printing way easier and extremely convenient. 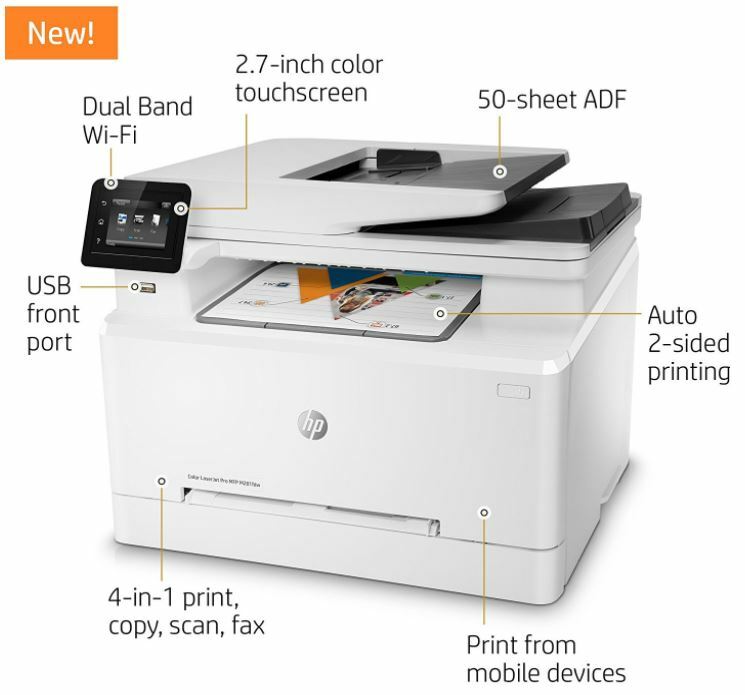 Aside from those cool new additions, the HP M281fdw is truly an all-in-one machine. It can print in color, make copies, scan and fax, making it ideal for offices with a number of employees that may need to carry out a variety of tasks. 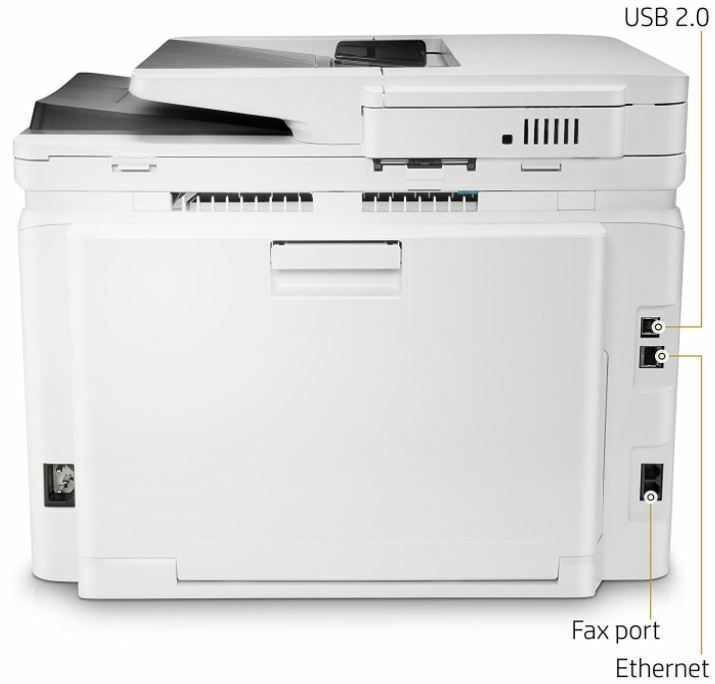 There is also an automatic document feeder, a scan-to-email option, a print from USB drive option as well as Ethernet connectivity. Needless to say, this printer has all the bases covered. However, when compared to its earliest predecessor, the HP Color LaserJet Pro M254dw we didn’t see a ton of major improvements. The only main difference was that the earlier model was only a printer, whereas the M281fdw is an all-in-one device. Both models have the exact same print speeds as well as paper tray capabilities. They can also print in the same sizes, and are both fully wireless. Making the M281fdw able to handle scanning, copying and printing is really the only main thing setting it apart from the M254dw. While the HP M281 does have a ton of really exciting features, it still has its limitations. It’s powerful, but it may not be the printer for a large office. We did find that while the speed of 22 sheet a minute was fast for one or two people, any more than that and we found ourselves waiting for jobs to be completed. Also, the 250 page paper tray is substantial, but after three, four or even five people started to send jobs to the printer we found that we had to refill it pretty quickly. That being said, this printer isn’t sold as the kind of machine that could support an office with 20 employees. It’s more designed for smaller teams who won’t overload it with work in short amounts of time. In general, we found it easy to use. The icons on the touch screen were clearly labeled, and the interface was very user-friendly. The app was similarly designed. 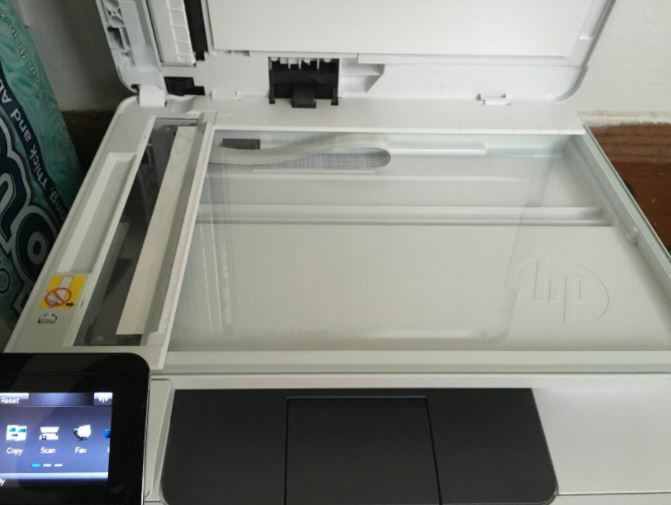 Using the fully-integrated HP app was about as intuitive as using the printer itself. The icons were clearly labeled, and there wasn’t much guesswork involved when it came to printing, scanning or managing the printer’s settings. Also, connecting to the printer directly from a smart-device was about as easy as connecting to any WiFi network. The quick set-up and efficiency were definitely major selling points, but like any piece of equipment the HP M281 does have some limits. If you’re aware of the kinds of workloads this machine is meant to handle, you’ll be pleasantly surprised when you use it for the first time. The HP M281fdw is certainly a powerful piece of office equipment that can hold its own among other similar printers on the market. It is extremely easy to use, has tons of built-in features and is seamless blend of convenience, efficiency and versatility. It won’t be enough of a workhorse to power an office with more than five or six people, but for small teams it is certainly an ideal choice. The fully-integrated app was easy to use, and so was the direct WiFi option. The M281 gives you tons of options to print, copy or fax documents, so that a lot of the stress of transferring files from a tablet, phone or laptop is completely eliminated. It wasn’t a huge improvement over its most recent predecessor as far as new features, but it was a step up because of its versatility and ability to perform multiple tasks. If you’ve got a small but busy team that needs a reliable, speedy printer that they can count on, the HP M281 is certainly worth considering. I buy today this HP.Is a single slot for A4.How about photo print 10×15 cm?